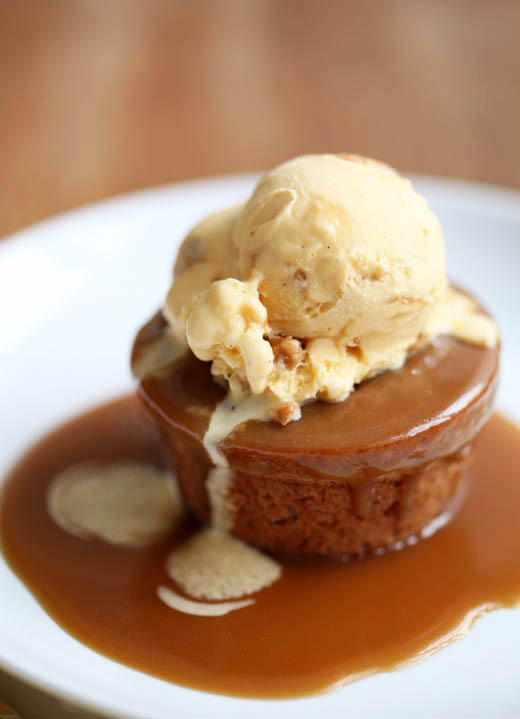 American Masala’s Sticky Toffee Cake! 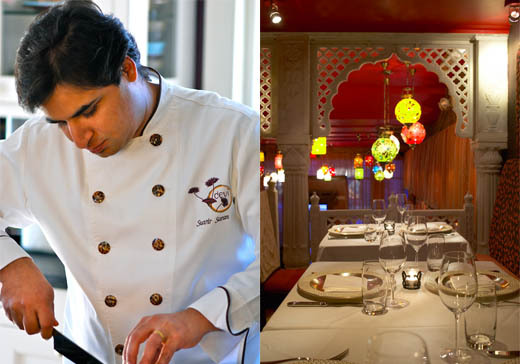 Update 3/3/11 – Suvir Saran will be appearing on Top Chef Masters, April 6th on Bravo! I could not be more excited for him and for all of us to get the opportunity to watch him in action! My ideal day consists of walking around NYC, eating oysters, going to museums to see great quantities of art and then finishing with an incredible meal. This is precisely what I did with my family during our trip last month. My boys were fine until about hour 3 at the Met, when they just wanted to leave to grab a hot dog and run wild. They were fed up with all the talk of brush strokes, juxtapositions, impressionists and cubists. Yeah, it was a stretch for them, but I figure someday they will appreciate me for it, or not? We grabbed them a snack to take the edge off and then headed to dinner. I was so excited for this meal, not only because devi is the restaurant owned by my dear friend Suvir and his food always brings me joy. I was also thrilled to be sharing the evening with my family, including my mother and my aunt and uncle. My aunt Sally’s mother grew up in India and had introduced me to Indian cuisine when I was a kid, in fact, Sally introduced me to most foods when I was a kid. I knew she would fall quickly in love with devi. I met Suvir several years ago at a pastry conference hosted at the CIA. Suvir was one of the presenters. He talked about blending more flavors of the world into the palate of American desserts. He was confidence Americans want to experience flavors beyond vanilla and chocolate, I whole heartedly agree with him. His food at the conference was intense and fresh and clean. You could taste every spice and ingredient, it was unlike any other Indian food I’d ever eaten. I was in awe and have been ever since. He has become a mentor, a brother and a dear friend to me. His skills go way beyond the kitchen. He and his partner Charlie have established a farm where they raise animals and run the American Masala empire, they design kitchen accessories, write cookbooks and Suvir is on a team at Harvard to educate people on how to eat a healthier diet. Now you see why I am in awe. But, the reason I fell in love with this chef was only partly because of his food, it is also his generosity and heart. He and Charlie give back to their community and to society as a whole. They are the epitome of good people! 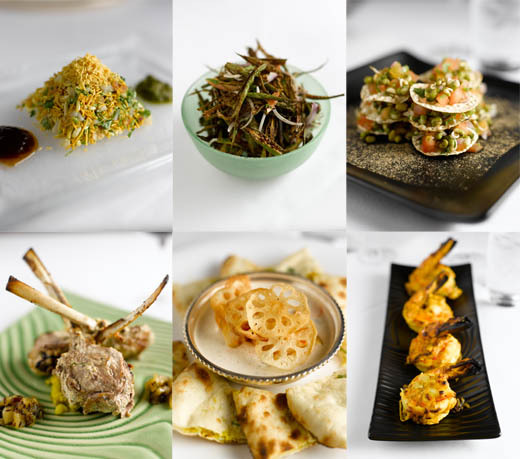 Here is a sampling of the meal we ate at devi. By the time we got to the second course my 11 year old son leaned over to me and said “Mom, I’m sorry I was so fussy at the museum, this is really fun!” The power of really good food. We sat and ate for more than 3 hours. The staff was incredible, the wines were thoughtfully matched and the atmosphere is both glamourous and comfortable. When the lamb chops (bottom left) came to the table my 9 year old declared that “they are cooked to perfection!” He ended up with a pile of bones on his plate as he talked everyone at the table into giving him their chops. Clever kid. The pastry chef sent out a sampling of every dessert of the menu, a gesture of deep understanding of what would make me happy. When my boys not-so- discretely devoured a couple without me getting a chance to try them, our waiter promptly brought more. I tried to protest, but then was seduced by the mango cheesecake and instantly cleaned the plate. The coconut-lemongrass sorbet was so lovely and fresh that I could have eaten a pint. We were all happy to point of laughter and tears at what a memorable evening it was. An experience everyone should have. This is a cake that I recently have fallen in love with and have tried almost every version from here to Australia. A cake that is most often called a pudding. The cake is made pudding-like by adding sweet sticky dates to it, then a sweet toffee sauce is poured over the top, which seeps in. This version in honor of American Masala has fresh ginger and other spices just as Suvir inspired me to do the first time we met. In a small pot bring the dates and water to a boil, turn the heat down, add the baking soda and simmer for 5 minutes. 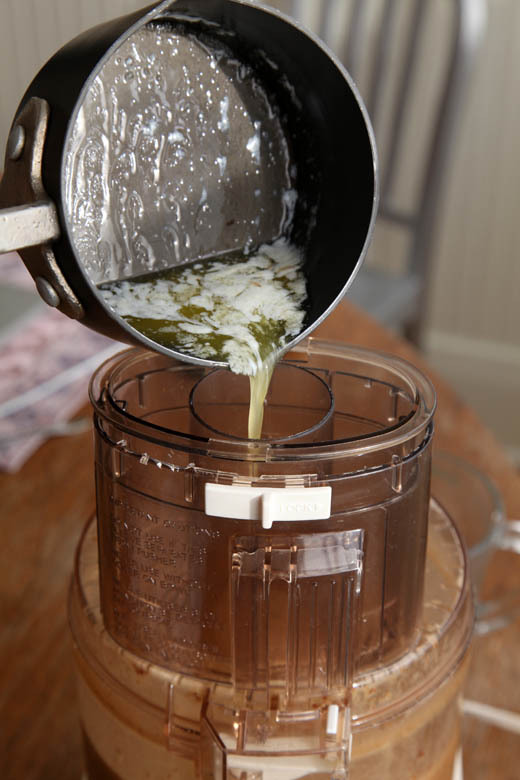 Pour the dates into the bowl of a food processor, add the sugar and blend. Add the eggs and combine. Add the fresh ginger and vanilla and pulse to combine. While the machine is running slowly add the melted butter. Dump the date mixture into a large mixing bowl. 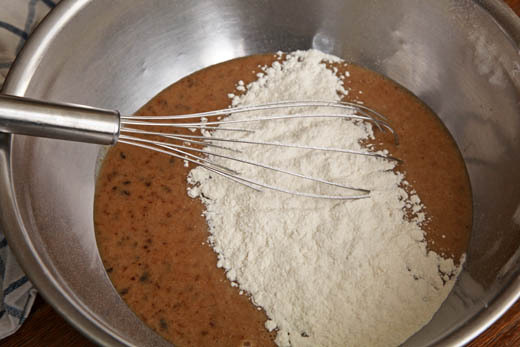 Whisk the dry ingredients together and then add them to the date mixture, only mix until combined. Pour the batter into the prepared pan and bake for about 30 minutes (muffin cup version should be checked after 20 minutes) or until tester comes out clean. 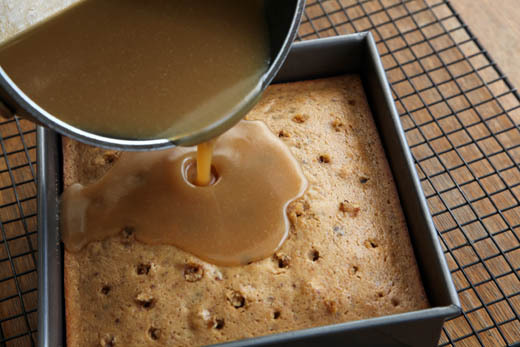 While the cake is baking make the Toffee Sauce: Heat the butter, sugar, cream, rum and salt in a medium sauce pan and simmer until the sugar is disolved. Poke holes all over the cake with a skewer and pour half the hot syrup over the hot cake. Return to the oven for about 3 minutes. To make the Brittle: Heat the sugar, water, and cornsyrup in a large sauce pan over high heat. Allow it to boil untouched until it starts to turn amber in color. At this point watch it carefully. 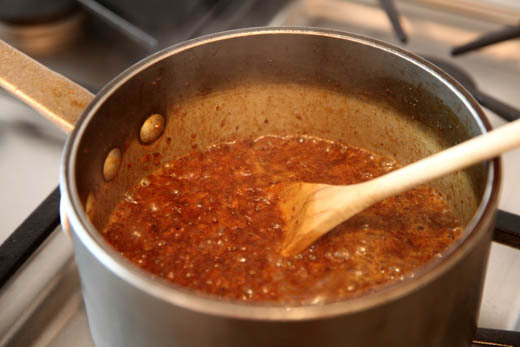 Stir the caramel so it doesn’t burn, it tends to caramelize unevenly. 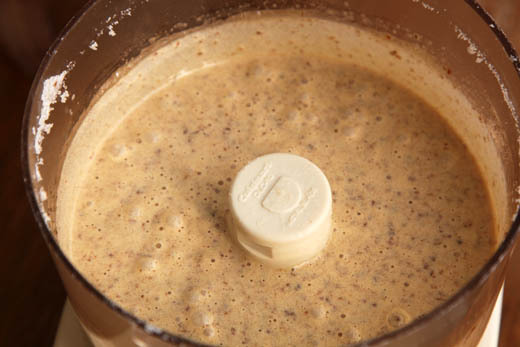 Once it is a nice dark caramel color (it may even start to smoke slightly) add the nuts and baking soda and stir. The mixture will foam when the baking soda is added. Pour the brittle onto a silpat and quickly spread it out. Cool completely. Can be made days ahead and kept in an air tight container. Once you are ready to make the ice cream break up some of the brittle in a mortar and pestle. This one was designed by Suvir. 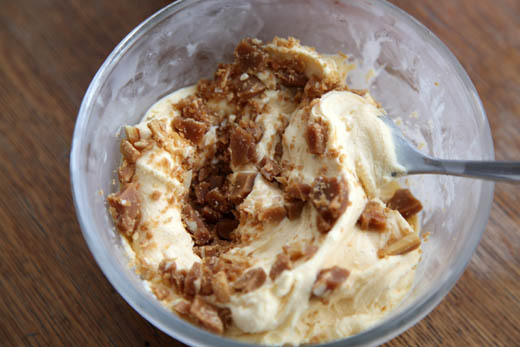 Fold the brittle into your vanilla ice cream. Top the cake with ice cream and pour on a bit more of the sauce. Last weeks winners of the Williams-Sonoma gift cards are Natalie and UT! Congratulations and let me know what crazy kitchen equipment you end up getting! My favourite spice to use is GARLIC. The health benefits alone are great, but the aroma that fills the kitchen is fantastic. When in a stirfry and not chopped, they are like little candies in your dish. Just a great spice to have on hand for all types of cooking! Seems like lately I’m using cumin all the time, but my favorite spice is Maharajah Curry Powder from Penzey’s. Just used it in a coconut curry with fresh fish, peppers and broccoli the other day…heavenly. Cardamom. I want to throw a party every time I have an excuse to put it in something. Ginger. I’m searching for the perfect gingerale recipe…I like it hot! I like cardamom, but it’s easy to overdo it, so my favorite would be cinnamon. You can add it to almost anything and instantly make it more interesting and more homey at the same time. Yum! DEVI. I think I use cumin most consistently, but love cardamon. Would love to learn more about using saffron, but that comes at a cost! I’m leaning heavily towards my favourite spice being cumin. It really transforms a dish in a heavenly way. I’m also dabbling with grinding my own spices, so I’d love a mortar and pestle to play with. Cinnamon. It’s so warm and inviting and just makes me feel cozy every time I throw it into a recipe. I use a lot of cinnamon and vanilla bean. It seems like I am always buying them. I would love to start growing and grinding my own spices and herbs. Cardamom. I love a good cardamom bread, and lately, it’s gone in my oatmeal. And I remember long ago drinking coffee brewed with cardamom pods. I keep meaning to do that again. my favorite spice is definitely cinnamon. I buy it by the bulk and not only bake with it, but I sprinkle it on everything too, even my coffee! I love nutmeg in sweet or savory dishes. I’m definitely a spice girl and I love coriander and cumin! They are always present in most of my curries and breads that I make at home! Totally love it! I know this is an older post and I’m sure uve tried the restaurant I’m about to mention. But I thought if give it a shot. I particularly like Copper Pot in Minneapolis. Especially if u order off their menu. Truely delicious! Devi! I have been loving ginger since having a stomach bug lately. Though my kitchen isn’t “home” without Za’atar. DEVI: I love shichimi, the Japanese blend of 7 spices usually containing a few chili peppers, citrus zest, ginger and sesame seeds. It’s wonderful on noodles and simmered vegetables, but also works nicely with sweet ingredients like a brown sugar glaze for nuts. I love, love, love cumin and use it as often as possible! My favorite spice is nutmeg. I am looking forward to trying some of the different curries they offer at The Spice House though. My favorite spice is cardamom because it is so subtle, exotic, and fragrant. I love cinnamon. And curry. They make everything more delicious! Cloves are one of my favorite spices, and particularly because of the part they play in many of Suvir’s recipes. Cardamom is a close second, though. Devi’s dessert looks delicious. I had plans to make your blackout cake this weekend, but this pudding/cake may take priority. Thanks for the recipe! The devi desserts are gorgeous. Bay leaf has become my new favorite addition to desserts. 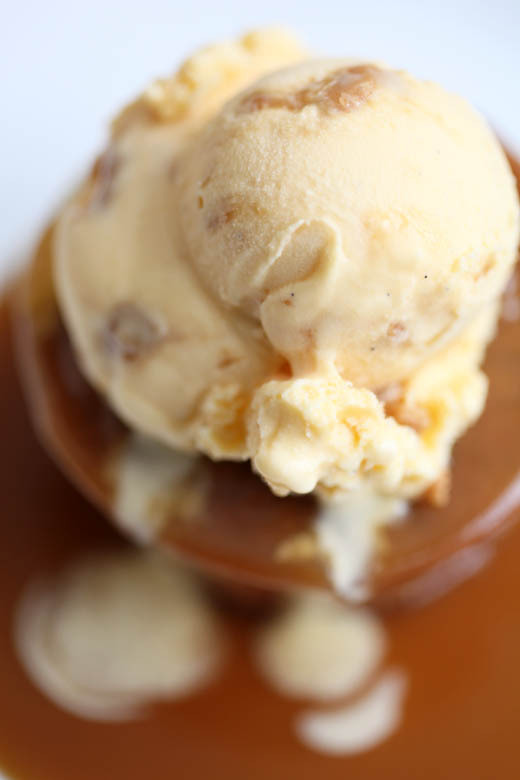 It’s fabulous in caramel and fruit reductions – especially with peach or plum. And it goes nicely with winter spices too. I’ll be in NY in May! Can’t wait. Favorite spice is smoked paprika, absolutely. And pretty much every dish I make (not dessert:) has garlic in it – I’m part Italian, mmmmm, gotta love that garlic! Saffron,I am a indian and use it in desserts and as well as savoury dishes.The aroma and colour of saffron are very nice.Do try it. Do vanilla beans count as a spice? It’s like solid gold caviar to me! Wish I lived near NY! My favorite spice is nutmeg. Until I took a cooking class, I had never used freshly grated nutmeg (nor used it in potatoes!). Now I would never use anything but freshly grated. I enjoy going to the spice store and getting a little bit of this or that and trying a recipe around it. DEVI. I am making this pudding ASAP it looks amazing. As for spice, I think I go through cinnamon and cayenne pepper the fastest! Cinnamon, nutmeg, Mexican vanilla ———-they are heavenly! My favorite spice to use currently is cinnamon. Yum! Thanks. Garlic or Basil for sure. It’s very hard to choose. Cinnamon is one of the best. How can you have just one favorite spice? There are to many good ones to limit it to just one. I love anise but then there is cardamom, clove, garlic, mint, fennel and on and on. This cake looks luscious! I love cardamom and nutmeg. For me, cinnamon would win, hands down! Smoked Paprika. A new love of mine. What a beautiful evening you had to cherish for always. Ginger has to be a favorite. It is versatile in both savory and sweet dishes lending a warmth and bright character to many recipes and cuisines. Lovely post Zoe…from a fan of all mentioned here! It is kind of like liking vanilla ice cream (which I love) but my favorite spice is good old fresh ground black pepper. I really love to use cinnamon! I love cinnamon. It permeates the whole kitchen and one of my favorite christmas cookies are Zimtsterne (cinnamon stars). There never can be too much cinnamon in them. My favorite spice has to be Nutmeg. I don’t know what it is, but it’s not the hallucinogenic properties, I swear! I think it’s the smell. Fresh Dill – there is no other smell that just makes me want to whip up a fresh dip! Cinnamon is my favorite spice! But after moving to Seoul, garlic has become the one thing I use most. My favorite spice is Chili Powder. My grandfather owned a Mexican / Latin American food store in St. Paul (MN) for many years, and was known far and wide for his chorizo recipe. The aroma of Chili Powder brings him back to me — I can see, hear, and smell all of those childhood memories! My favorite spice is cumin. I love it in chili and carnitas but I also use it whenever I want a little smokey flavor in anything. I have two favorite spices. The first is cinnamon (and, ok, cardamom too) for sweets and then cumin for the savory dishes. I think that both really raise the bar on recipes and ALWAYS please my palate. Fresh mint. Who could resist how fresh that smells and tastes in the Spring? I planted a small sprig of applemint which promptly took over one of my flower beds. People warned me that it was extremely invasive, and I just have yet to figure out why that is a problem? Hm. Extremely large quantities of fresh mint. Just can’t see a down side here. DEVI – Being Indian, I love all spices and especially if they are ground fresh into a masala. My favourite spice would be ginger and garlic since we use it in Indian cooking. Zoe – You are something else my dear! You make everything seem even more magical than it is. You also have transformative powers unlike most I know. In your hands a good dessert becomes great and a great one ethereal and divine. Thanks for your kind words and your support, always. You are a gift to have in our life. Charlie and I cherish your friendship and miss you dearly when away from you, which is most of the time. We do feel connected to you every time we enjoy your creations, the breads we now make at home, and the pizza that comes out of our oven, and charms one and all. Hope you find strength in your cooking and in your sharing as you deal with the loss of your grandma. Please accept my condolences with this note. I will email you and call you as well. Just back from India and already on a plane, this time headed West to SF. Will call as I land and email as well. How wonderful technology is that we can be connected with work and loved ones even as we fly. Thanks for featuring this recipe, and also writing about your time at Devi. Appreciate your generous words and your time a great deal. I’d have to go with basil, and fresh being my MOST fave. I freeze my leaves every summer for crushing into warm dishes throughout winter (terrific in soups!). DEVI. Ginger. I love crystallized in granola! Also, fresh ginger in stirfries and ginger tea for an upset tummy. And, have you ever had ginger Altoids? DEVI. Ginger: in granola, stirfries, and tea for an upset tummy! Also, have you experienced ginger altoids? DEVI. Ginger–in granola, stirfries, and tea for an upset tummy. 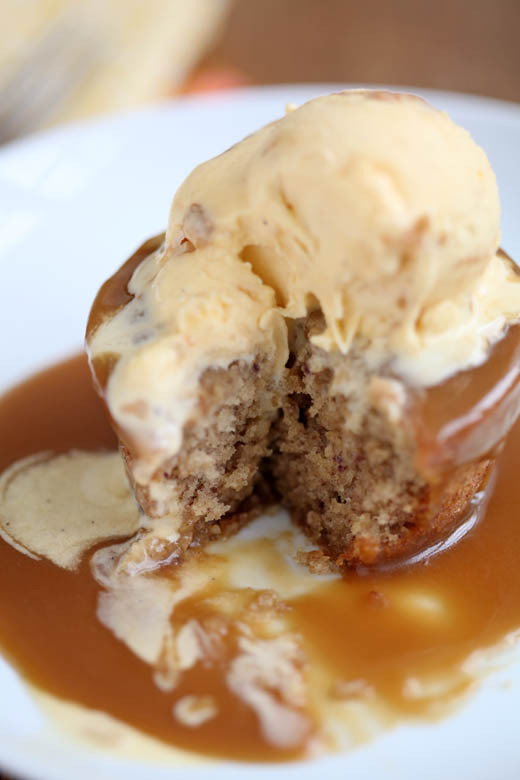 First – I love sticky toffee pudding and want to eat this right now! Second – I just got your book (Artisan Bread in 5 minutes a day) in the mail today and can’t wait to try out some recipes. Third – I love cinnamon and will try to put it on everything! I absolutely love cumin in almost everything!!! I used to have a wooden mortar/pestle, but lost it along the way. This one’s lovely. The picture of your sticky toffee cake literally stopped me in my websurfing tracks. I hit the back button for you darlin’. Can’t wait to try this recipe. My favorite spice is salt. Because I use it almost everything. My second favorite is cumin because I wish I could use it in almost everything. Cinnamon. I learned how to make crazy Granny Shelton’s cinnamon rolls, and my love and consumption of cinnamon has increased exponentially. My favorite spices are cinnamon and garlic! Is garlic considered a spice? If it is that is my favorite I can’t get enough of it. I love to cook it for a long time and let it get sweet! My favorite spice is garlic powder but mostly a tie with cumin. Yum! DEVI sounds like a great place to dine. My hubby and I will be in NYC singing at Carnegie so we could totally try this place while we are there! Thanks a bunch! DEVI. Black pepper (fresh ground) is probably my favorite and most used spice. Crushed red pepper flakes are a very close second, with garlic coming in third. This looks devi-ne! I can’t wait to make it, oh man. Ohhhh man. I love cinnamon. It’s versatile and adds depth to hearty standards. Hi Zoe – Try making his Cardamom-Pistachio Cake next. You and Suvir are just the best! Check you email from me when you get a chance. My favorite spice to use is tarragon. I love it on anything poultry, in soups, and, most recently, on baked sweet potatoes 🙂 For desserts, can’t beat cinnamon! It is just such a comfort spice, homey and warm. Besides, nothing cinnamon-y can be bad! salt – table, kosher, sea. I love cardamom, especially extracting the seeds from the pods and crushing them. Coriander is another favorite. Fresh mint (if herbs count!). I love it. My favorite spice/seasoning would have to be sea salt… plain and simple, but when used well— just brings out the natural wonderful flavor of the food itself!!! 🙂 However, I think I love almost all the spices! For savory dishes i love tarragon….for sweet and savory, such as my chili recipe..cinnamon. Happy baking everyone. For savory dishes, I tend to use cumin a whole lot. For sweet, I love cinnamon. I love really strong cinnamon and cumin. What a great question! Infact i lovvveee Zoe bakes , and i must get myself an email sus so that i miss not a single post! U have baked a beautiful sticky toffee cake, and am thrilled to meet Suvir thru u! Am gng thru the sites , right now and they are gorgeous! I have checked out “American Masala” from the library many times and was just thinking tonight that I should just buy it already! My favorite spice is fresh ground pepper. Even as a kid I couldn’t believe it when friends and restaurants didn’t have a pepper mill! Of course it depends on what I’m making, but I do love cumin, and pimentón is another favorite. Wish I had plans to go to NYC. I’ll have to be content with spicing up my Minnesota kitchen for now. Cardamom, Coriander and Ginger are three of my favorites. (DEVI) It would have to be ginger. I find excuses to put it into anything. I’ve even made homemade ginger ale with it. 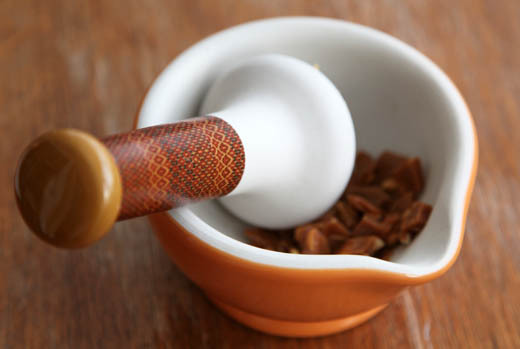 So hard to decide a favorite spice, but I will try to narrow it down if I have a chance to win a mortar & pestle – hard to believe, but I lost mine and I sorely miss it. Favorite savory spice/herb: Lemon thyme (Lemon Thyme biscuits are to die for!). cumin. such a wonderful smoky addition to so many things. Oh I love it. So much. Devi sounds amazing! Hope I get to make a trip to NY sometime to go pay my respects! In the meanwhile will have to try that amazing cake! My favourite spice is cardamom. I love putting cardamom into tea and love to bake with it too. Add some to my pumpkin pie as well as carrot cake and it always takes me back to the foothills of Munnar and my uncle’s cardamom and vanilla plantations back home..
My favorite everyday spices are garlic and thyme…I love the woodsy taste of thyme. And garlic is, well, garlic and just plain yummy. Ginger and nutmeg are my favorite “exotic” spices. I am amazed at how good they are in both sweet and savory dishes. It’s like magic! I’m a big fan of cinnamon due to the versatility. It works in sweet and savoury dishes! I absolutely LOVE cinnamon more than words can describe!!!! My son and I are way through Dori Greenspan’s Baking book with occasional side trips – one for Zoe’s pear and apple cake. Our favorite spice – we like them all, and especially in surprisingly delightful blends – however, a current favorite is freshly ground nutmeg. We love your pictures Zoe and your joyful spirit! MMMMM having grown up near Gilroy, CA I’m going to go with garlic…..yum. Right now I am in love with smoked paprika… miam! I actually work on a farm in the same county as Suvir’s. Maybe I’ll run into him at the market sometime. Anyway, my favorite spices are garlic and cinnamon, though not usually together. I put garlic in almost everything I cook. And lately, the frigid weather has inspired me to make lots of hot chocolate, to which I add cinnamon to make it that much more delicious. Basil, with garlic being a close second. Cumin, it’s so versatile from Spanish, Mexican, Indian food too. I’m off to make this cake! I went and bought a lot of dates yesterday, I’ve been drooling in my mind since I saw this recipe. I couldn’t agree more–a great day in NYC is oysters at Grand Central, walking in Central Park, the Met, a great meal, and maybe some good jazz before calling it a night in the wee hours. Favorite spice? Sorry, too many to pick just one. I have always loved nutmeg and mexican vanilla…but have recently been introduced to many uses and loves for coriander and (a year ago I never thought I would be finding myself say this)…turmeric. Thank you Suvir, for helping me culture my palate! My favorite spice is ginger– I love it in sweet and savory dishes. In the winter it makes me feel a little warmer just to get a wiff of ginger. DEVI – I love Herbes de Provence. I use it on lamb, beef & pork dishes. It adds something special to the meal. This cake recipe looks heavenly! DEVI. If I had to pick one on a desert island, I would have to say Garlic. Love the site! Cinnamon….because of it’s many health benefits! I’d love to win a mortar and pestel! a delicious pudding! my favorite spice is cumin. DEVI. Cinnamon, ginger and Coriander are my favorite spices. Devi, this looks absolutely yummy! Devi! Cinnamon is my favorite spice. I love how it can be used both in sweet and savory dishes, and how it can warm you up just by smelling it (at least it does for me!). Devi! This would be too cool to win because that is my sister’s name! Growing up in a suburb of Dallas meant we never heard of anyone or any place else with that name. My sister will be so excited to see this! My favorite spice, if I have to choose only one would have to be garlic; I can’t cook dinner without it. Had a version of this “pudding” in Stratford-upon-Avon last time I was in England – heaven! Looks even more glorious with the ice cream. Can’t wait to give this a try. Cumin! Or cinnamon… or tumeric… or saffron…… the list goes on and on. i love cumin, i use it a lot. I also really loved smoked paprika from Penzeys. I just can’t get enough. My favorite spice is ginger! I love the refreshing taste that it brings to recipes! My favorite spice is cinnamon. Can’t get enough of it! @melissa – perfectly stated! I want to throw a party every time I use cardamom too. Do you grind it up with coffee beans? I want to swoon at that aroma. What a great post, Zoe. Our family loves Suvir’s generosity and kindness as well. Greatly looking forward to his upcoming book about farm cooking and life there on American Masala farm! I love this recipe! But how do you disguise all those holes younpoke in the top? Pear Galette from The Salty Tart!